What do you get when you ask a child to draw a mountain? Nine times out of ten you’ll get a tall, pointy, pyramid-shaped object cloaked with snow. Chances are it will also be a single glorious entity, uncluttered by other eminences, towering above all else. Most mountains, certainly in Tasmania, but even in the Alps of Europe and the South Island of New Zealand, are not quite like that. Mont Blanc, the highest in Western Europe, is snowy for sure. But its pyramid is obtuse, relaxed, and its throne is jostled by a retinue of Aguilles and other peaks. 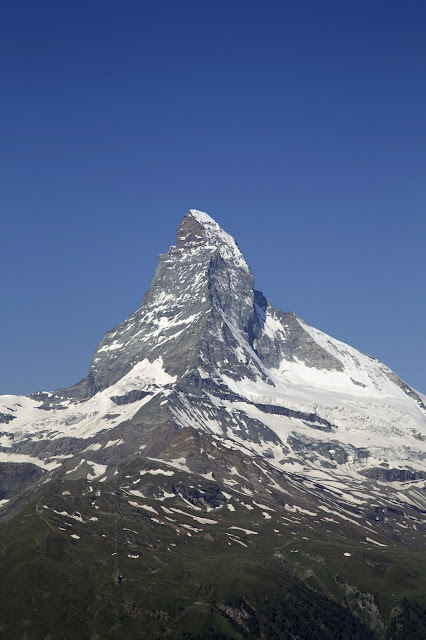 In the Bernese Alps, classic mountains such as Jungfrau, Mönch, Finsteraarhorn and the Eiger only approximate the triangular, and they have to share the heights with a crowd of other peaks. But the Matterhorn? 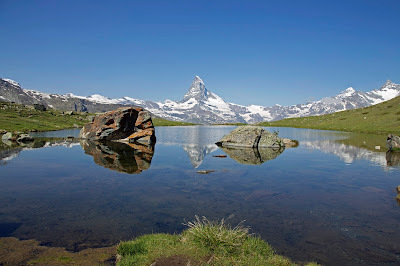 Ah the Matterhorn is exactly that classic child’s mountain shape! 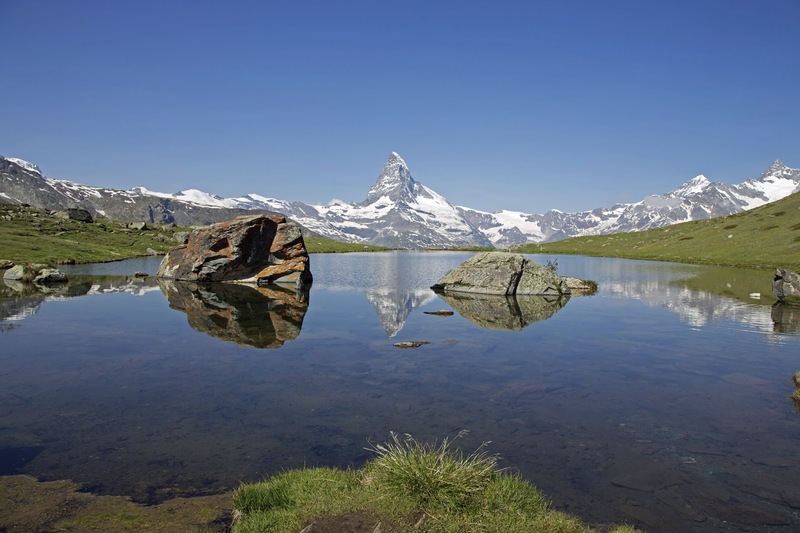 Although it’s not the highest – it only just sneaks into Switzerland’s top ten highest – it is an exuberantly mountainous mountain. Fine 20th century French climber and writer, Gaston Rébuffat, captured it perfectly. I share that apprehension as we settle into a chalet down valley from Zermatt, in Täsch. 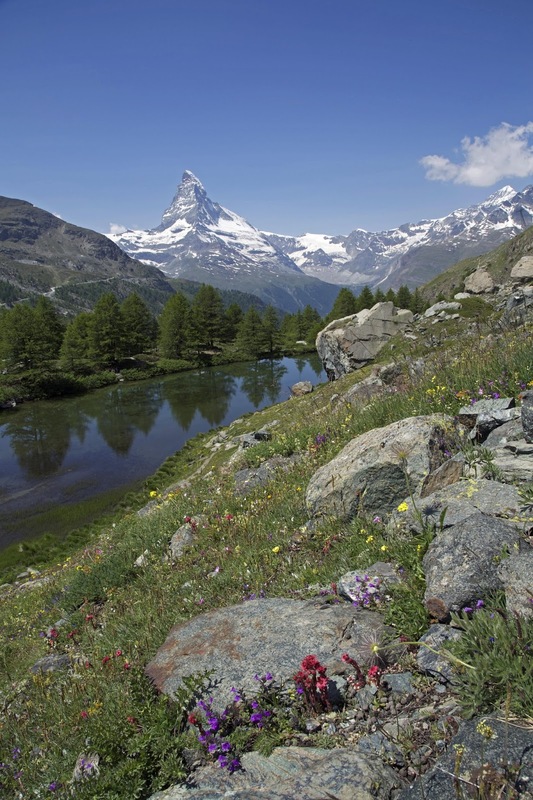 Its deep, steep-sided valley keeps the Matterhorn frustratingly out of view. It’s the following day before we board the train to Zermatt for a potential meeting with the mountain I've admired from afar for so long. It helps that the weather is also perfect as we ride the gondola high into the mountains, then walk higher still towards Rothorn. This and so many other worthy mountains surround us, and there are wildflowers everywhere. But all the while our eyes keep returning to the massive, irresistible Matterhorn. What makes it so remarkable is partly down to accidents of geology. The upper thousand metres or so of the peak is composed of gneiss, a metamorphic rock that often has planar, sheet-like structures. In some cases these can peel away in layers, leaving both flat faces and sharp edges. Glacial erosion of the Matterhorn has produced just such features. But in addition the glaciers have swept away the rubble that would normally clutter the scene. From a climber’s point of view, the result is both enticing and terrifying. It took until the mid 19th century for the mountain to be first climbed. 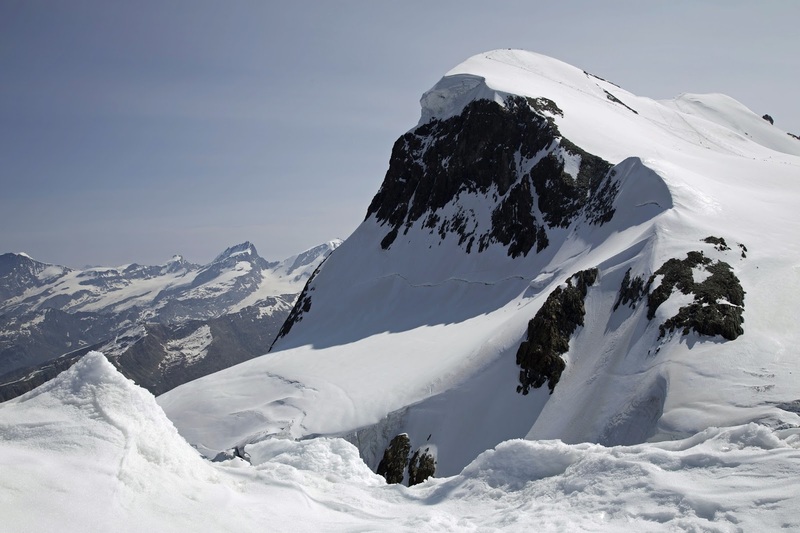 Englishman Edward Whymper and a team comprising Zermatt locals and other Englishmen, reached the summit on July 14, 1865. They had beaten an Italian party, climbing via a different route, by only a matter of hours. Whymper wrote that they remained on the summit for an hour, “one crowded hour of glorious life”, before starting their descent. Disaster struck shortly afterwards when one of the party slipped, taking himself and three others to their death. All seven had been roped together, and only the fact that the rope broke saved Whymper and two of his Zermatt guides. 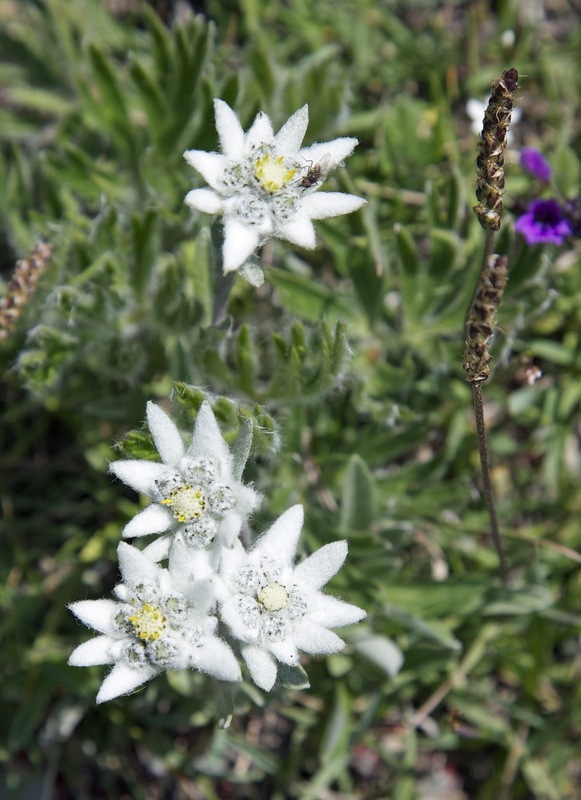 On our own July day, nearly 150 years later, we pause to look closely at the mountain’s terrible beauty. It stands stark and clear against a perfect blue sky, its gunmetal grey upper ramparts spattered with patchy snow, save for the snowier upper section of the north face. Here and there the dark grey has a reddish tinge, including near the Hörnlihütte (Hörnli Hut). Whymper’s route went up the Hörnli Ridge from there. To us it looks absurdly difficult, yet by the 1930s this “easy” route was being traded for the seemingly impossible north face. We shake our heads as we look at the sheer face around the corner from Hörnli, but in 1931 German brothers Toni and Franz Schmid succeeded in climbing the route. If there can be any final heroic ascent of the Matterhorn, then Walter Bonatti’s solo winter ascent of the north face would have to be it. In February 1965, nearly 100 years after Whymper’s climb, the remarkable Italian draws near to the top of the perfect mountain. Just looking at the Matterhorn, even from a safe and sunny meadow, I almost do the same.